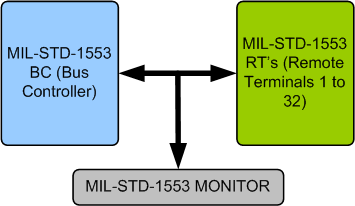 The MIL-STD-1553 Verification IP is compliant with MIL-STD-1553B specification and verifies MIL-STD-1553 interfaces. It includes an extensive test suite covering most of the possible scenarios. It performs all possible protocol tests in a directed or a highly randomized fashion which adds the possibility to create most wide range of scenarios to verify the DUT effectively. Supports Bus Controller (i.e,BC), Remote Terminal (i.e,RT), and Bus Monitor (i.e,BM) operation. Supports Single/Dual/Quad channel, dual redundant bus communication modules. Supports configurable length of word length, default 20 bits. Supports configurable length of data bits, default 16. Supports configurable message length per transfer. Supports single or multi bus control. Callbacks in Bus Controller and Remote Terminal for various events. MIL-STD-1553 Verification IP comes with complete testsuite to verify each and every feature of MIL-STD-1553B specification. Faster testbench development and more complete verification of MIL-STD-1553 designs. Easy to use command interface simplifies testbench control and configuration of Bus Controller and Remote Terminal. SmartDV's MIL-STD-1553 Verification env contains following. Complete regression suite containing all the MIL-STD-1553 testcases. Examples showing how to connect various components, and usage of Bus Controller and Remote Terminal and Monitor.